As was widely reported yesterday — and with visceral imagery per this Gawker headline — two more cruise ships experienced mishaps while out at sea. As was the case with last month's catastrophe (in which 4,200 people were stuck on a boat for five days without power or working toilets), both were Carnival cruises and both involved mechanical failures. The first of the two snafus occurred at port in St. Maarten as the generators to the Carnival Dream died, preventing the boat from departing — as well as temporarily inhibiting use of the toilets. While that latter detail might have been blown out of proportion by the media, there were power outages and passengers reportedly weren't allowed to leave the boat for several hours. Eventually, Carnival arranged to fly all passengers home. 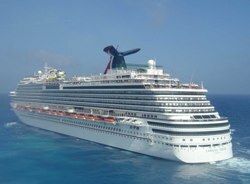 Meanwhile, the Carnival Triumph in port in Mahogany Bay, Roatan was forced to skip the boat's final stop in the Cayman Islands due to a technical issue with the ship's thruster, which prevented it from reaching optimal sailing speeds. The ship returned to Tampa early, and passengers received a $100 credit and 50% off a future cruise. While reports about the Carnival Dream vary in severity, at least one passenger complained of overflowing toilets, which in turn lead to some nasty headlines worldwide. And there's no forgetting the horrible conditions from last month's debacle that resulted from a fire. With accounts bordering on the ridiculous — "the cruise ship was disabled and left to float for days in the Gulf of Mexico as passengers filled it with excrement and built makeshift shanty towns on deck" — these public disasters should surely deter travelers from booking a cruise, right? It seems as if dealnews data would suggest otherwise. If you recall around this time last year, there was another batch of cruise-related calamities that, in theory, would have kept any conservative traveler at a distance. Given the severity of those issues (which included norovirus outbreaks, an engine room fire, and actual passenger deaths), we asked our readers: would you still be willing to take a cruise? Overwhelmingly the answer was yes. Out of almost 1,000 responders, 87% voted for the affirmative. (The complete results are pictured below.) Moreover, according to dealnews' data, the average number of people clicking on cruise deals actually increased by 40% in the month following the Costa Concordia accident, in which the boat partially sank. A possible explanation for the increase in consumer interest is the fact that deals were coming in at amazing prices last year, likely in response to the tragedies. And 51% of the respondents from the above poll specifically said that it would require a good deal to make them overlook the mishaps and willingly hop aboard a sea-bound trip. Apparently, the deals last year were good enough to encourage them. So far during this disaster season however, deals have not been extraordinarily good (although we have seen an increase in the number of broad sales that discount numerous trips). But despite the flat deals, the average number of clicks for cruise deals actually still went up by 13% in the two weeks after last month's engine fire. Deal popularity then re-calibrated the week after. It would seem then that concerns about mechanical failure, engine fires, and attacks on personal hygiene mean very little in the face of an extremely cheap vacation. Cruises are, and will continue to be, one of the least expensive ways for a budget-minded traveler to at least feel as if he or she is getting a luxurious getaway. 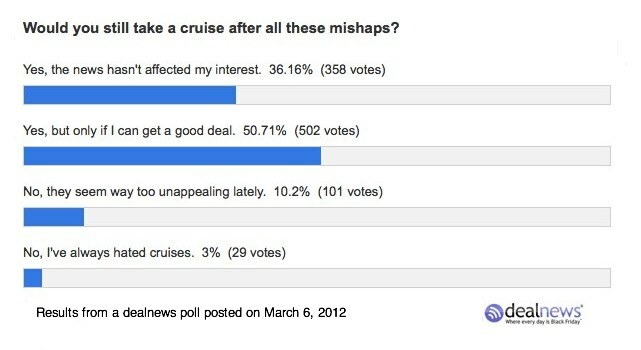 So bring on the public relations disasters; there will always be a demand for cruise deals. I would not stop going on cruises, just never use Carnaval. Obviously it is one company with similar problems on all ships. Seems someone is cutting corners. I heard a few people tell me they are the budget liners and if the cruise has extreme partiers or rude people they wont do much of nothing where as the others will not put up with it. Seems like just Carnival is crappy line. I just cruised on Royal Caribbean and had a perfect experience.